Afterward, Jesus was led by the Spirit in the wilderness, where he was tempted by the devil for forty days. 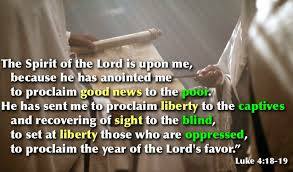 Then Jesus, filled with the power of the Spirit, returned to Galilee, and he began to teach in the synagogues. In the midst of everything we see around us in our world, in the midst of a transition in pastoral leadership in this congregation, the scriptures still speak to us today. In February, I’ll be attending a Transitional Ministry training event in Oregon. One of the books I’m required to read in preparation is Changing the Conversation: A Third Way for Congregations, by Anthony B. Robinson. It’s quite a helpful and readable book, and I commend it to you. This response, Robinson wrote, shows a lack of clarity about purpose. Over time, organizations tend to lose sight of whatever purpose called them into existence in the first place or they may drift away from it. When they’re not centered on their purpose, they devote a lot of their energy and resources to their own survival or maintenance. Also, when there’s a lack of shared purpose, congregations and pastoral leaders tend to become too focused on trying to keep everybody happy and together. You might hear people saying things like, “We can’t do that—so and so says if we do, they’ll leave the church… or withhold their giving…” or whatever. When there’s a lack of a strong sense of shared purpose, a few people can hold the congregation hostage and keep the leaders and the congregation from moving forward in new directions. It is indeed a recipe for burnout. As disciples of Jesus Christ, we have a mission to fulfill. When we listen carefully and prayerfully to the scriptures-- we discover that God's Word speaks directly to us. It suddenly can become very exciting...and very energizing. Littlefield Church has gone through a lot of changes over the years. The community and the world around the church have changed. When this congregation was planted, it was going to be a neighborhood church. The way they envisioned things in the beginning, they weren’t going to need a parking lot, because people were going to walk to church from their homes in the nearby neighborhoods in Dearborn or Detroit, or drive a short distance. That worked well for several decades. There was a time when there were two Sunday services, with people sitting in the balcony and an overflow room, when Littlefield had assistant pastors and Christian Education directors. In 1960, Littlefield’s membership peaked at 1,250. That was a pivotal time in local churches and on a national level, as church denominations lost anywhere from a quarter to a third of their members, and baby boomers deserted their childhood churches in large numbers. This was the beginning of some challenging times for Littlefield Church. The Rev. Harry Geissinger was called to serve as senior pastor in 1961, bringing the strong visionary leadership the congregation needed. The 1960’s and 1970’s were tumultuous times in our society, in the world, and in the church. The civil rights movement, the war in Vietnam, changing attitudes toward institutions, and many complex and divisive issues all had their impact on the church. Life in the metropolitan Detroit area was marked by social upheaval and a series of crises in the 1960’s, including block-busting, cross-district busing for schools, and the 1967 race rebellion. Beginning in the late 1960’s, Littlefield struggled with the impact of “white flight” out of its nearby Detroit neighborhoods and significant growth in the number of Arab-Americans of Muslim and Eastern Orthodox faiths in its Dearborn neighborhoods. As the Littlefield history document states, these changes in the community had the result of reducing the size of the Littlefield congregation and expanding the mission. Then, in the mid- to late-seventies, a need emerged and was identified: to develop a relationship with our Arab-American neighbors, to bridge cultural differences and overcome misunderstandings among Christians and Muslims. Since that time, Littlefield Presbyterian Church has taken a leadership in carrying out a ministry of reconciliation. Over those decades, the membership numbers of Littlefield and other churches were declining. But Littlefield was doing important work building bridges, promoting understanding between Christians and Muslims and members were reflecting the light of Christ as they served the needs of the new neighbors. It was after this mission study and an interim period that I was called to serve as your pastor. Over the 22 years that have followed, we’ve worshiped and studied and learned and grown and served God and our neighbors and witnessed to God’s love and justice and peace together. “Why we exist: To love God, one another, and all people. To show God’s love in our work for peace and justice.” Two short sentences to summarize why you exist as a congregation. You also worked on a list of your CORE VALUES. We worked on the statement of purpose because mission can't be an optional activity for the church. The church exists for mission. If a congregation desires to be a vital, growing community of believers, with a faithful future, they need to resist the temptation of quick, simple answers, follow Jesus’ example, and spend time in the wilderness to discern God’s will. They need to open themselves to the leading of the Spirit, so they can discover more fully the calling God has for them in this particular time. Littlefield Presbyterian: 85 Years of Mission on Facebook. Littlefield Presbyterian Church: Celebrating 75 Years of Mission and Ministry, 1930-2005, page 4. Quote from “Brief Statement of Faith” of the Presbyterian Church (USA), 1990.